Our hosts from January 2015 have invited us back to their garden again in January 2016! Their property is packed full of all types of succulents along with some cacti and tropicals. Some of the best succulent blooms occur in winter. 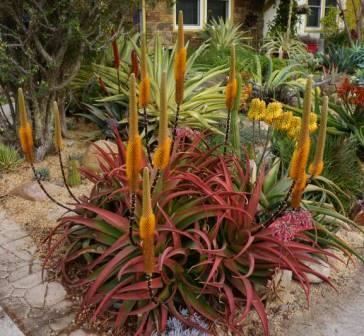 This garden showcases many aloes and other plants that put on a show at this time of year. January is aloe time and it seems the season is a bit early for some this year. 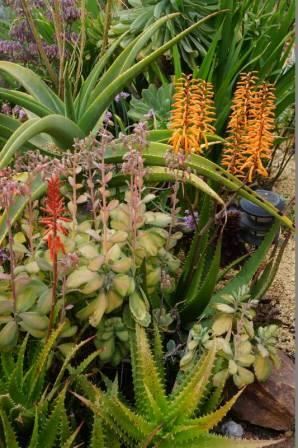 Aloe ‘David Verity’, some Aeoniums, and a few South African bulbs began blooming in December and others seem eager to show their floral beauty for the party. A number of tree aloes in the front are beginning to develop short trunks although it will be quite some time before they change the appearance of the landscape as we anticipate. The mesembs are also beginning to show off their flowers and an Agave nizandensis cross should be in fresh bloom for the party. Most of the plants in the ground and in pots are labeled and many are grouped with their closest kin nearby. The labels aid your search if you find something that appeals to you either through extras the owners might have for sale, other vendors, or other sources. One of the owners enjoys the search for more great plants to become acquainted with hence the many and intriguing forms of some of our favorites: Agave titanota, Faucarias, large chunky Glottiphyllums, and unusual forms of Echeveria agavoides. Euphorbias and cauduciforms have been added to our collection. The other owner enjoys propagating so young plants are sometimes available. Sometimes they have to remove mature plants from the landscape to make room for others and may have some available. This helps in moving plants along to new homes and keeping the other guy’s proclivity to obtain more great plants in check. We have also been out rock-hounding, another hobby we enjoy, which results in various staging material. Look for the blue dumortierite and our recent acquisition of petrified reed that will be fun to stage with. There are some additional container plantings, and of course, new pots! Again this year they will have appetizers, desserts, and beverages for you to try while you visit. The owners will have a succulent/cacti-related game with plant prizes for the winners! There will be seating and conversation areas to encourage leisurely chats. The San Diego Cactus and Succulent Society members have also been invited during the same time period and hopefully we can learn from one another about growing great plants. If there is heavy rain on Saturday 1-16-16 we will hold the party the next day, Sunday, instead. Hope to see you here!